Jason Kent Bateman (born January 14, 1969) is an American actor, director, producer and comedian. He began acting on television in the early 1980s on Little House on the Prairie, Silver Spoons, and The Hogan Family. In the 2000s, he became known for his role of Michael Bluth using deadpan comedy in the sitcom Arrested Development, for which he won a Golden Globe and a Satellite Award. He has also appeared in the films Teen Wolf Too (1987), The Break-Up (2006), Juno (2007), Hancock (2008), Up in the Air, Couples Retreat, Extract (all 2009), The Switch (2010), Horrible Bosses (2011), The Gift (2015), Office Christmas Party, Zootopia (both 2016) and Game Night (2018). Bateman was born in Rye, New York, and was 4 years old when his family moved to Salt Lake City, Utah, and later to California. His mother, Victoria Elizabeth, was a flight attendant for Pan Am who was originally from Shrewsbury, United Kingdom. His father, Kent Bateman, is an American actor, writer, and director of film and television, and the founder of a repertory stage in Hollywood. His sister is Justine Bateman. He also has three half-brothers. Bateman told Best Life magazine that he and his sister Justine supported their parents with the paychecks they earned from their television shows; he also revealed that he was managed by his father until Bateman was 20 and dissolved the business relationship. Bateman first appeared in a cereal commercial for Golden Grahams in 1980 and began his television career on Little House on the Prairie as James Cooper, an orphaned boy who, along with his sister, is adopted by the Ingalls family. From 1982 to 1984, he was a supporting character on the television show Silver Spoons as Ricky Schroder's "bad boy" best friend Derek Taylor. He appeared in the Knight Rider third-season episode "Lost Knight" in 1984, and a number of other small television roles. In 1984, in response to his popularity on Silver Spoons, the show's producers gave Bateman his own starring role as Matthew Burton on the NBC sitcom It's Your Move, from September 1984 to February 1985. In 1987, he appeared with Burt Reynolds on the men's team in the inaugural week of game show Win, Lose or Draw. Bateman earned the status of teen idol in the mid-1980s for his television work, most notably as David Hogan on The Hogan Family (originally titled Valerie and later, Valerie's Family, after Valerie Harper left the series). He became the Directors Guild of America's youngest-ever director when, aged 18, he helmed three episodes of The Hogan Family. After the series ended its run, he gained international recognition in the motion picture sequel Teen Wolf Too, which was a box office failure. In 1994, he played opposite Katharine Hepburn and Anthony Quinn in the television film This Can't Be Love. During this period, he had roles on four series — Simon, Chicago Sons, George & Leo, and Some of My Best Friends—none of which lasted longer than one season. He also directed an episode of Two of a Kind in 1999. In 2002, he played the frisky sibling of Thomas Jane's character in the feature film The Sweetest Thing. In 2003, Bateman was cast as Michael Bluth in the comedy series Arrested Development. Although critically acclaimed, the series never achieved high ratings and ended on February 10, 2006. The show was revived in spring 2013. Bateman won several awards for his work on the series, including a Golden Globe for Best Actor in a Television Series Musical or Comedy. He was also nominated in 2005 for the Emmy Award for Outstanding Actor in a Comedy Series. New episodes of Arrested Development have been released on Netflix with the original cast, including Bateman. Bateman performed commentary on the 2004 Democratic National Convention for The Majority Report with Arrested Development co-star David Cross, and hosted NBC's Saturday Night Live on February 12, 2005. In 2006, he appeared as a guest star on the Scrubs episode "My Big Bird" as Mr. Sutton, a garbage man with a flock of vicious ostriches as pets. In 2009, Bateman became a regular voice actor for the short-lived Fox comedy series Sit Down, Shut Up. He voiced Larry Littlejunk, the gym teacher and only staff member who can teach. In 2010, Bateman and Arrested Development co-star Will Arnett created "DumbDumb Productions," a production company focusing on digital content. Their first video was "Prom Date," the first in a series of "Dirty Shorts" for Orbit. In 2012, Bateman returned to his role of Michael Bluth for the revival of Arrested Development along with the rest of the original cast. The now-Netflix sponsored series released Season 4 on its Instant Watch website on May 26, 2013. The series was expected to continue its run as well as a potential feature film. For the new fourth season, Bateman was once again nominated for Outstanding Actor in a Comedy Series. Netflix confirmed that the entire cast of the show will be returning for a fifth season, premiering 29 May 2018. In 2017, Bateman returned to television as both actor and director in the Netflix drama Ozark, in which he plays a financial advisor who must relocate his family to Missouri in order to launder money for a Mexican drug cartel. Bateman's performance as Marty Byrde has drawn positive comparisons to Bryan Cranston's portrayal of Walter White in AMC's Breaking Bad. In 2004, Bateman appeared in Dodgeball: A True Underdog Story as ESPN 8 ("The Ocho") commentator Pepper Brooks, and in Starsky & Hutch as Kevin, Vince Vaughn's business partner. He reunited with Vaughn in 2006's The Break-Up. In 2007, he played former lawyer Rupert "Rip" Reed alongside Ben Affleck in Smokin' Aces, and also starred in The Kingdom, Mr. Magorium's Wonder Emporium, and Juno. In 2008, he co-starred with Will Smith and Charlize Theron in the superhero film Hancock. Bateman's 2009 films included Extract, written and directed by Mike Judge, and Couples Retreat, reuniting with Vaughn in a comedy chronicling four couples who partake in therapy sessions at a tropical island resort (Kristen Bell played his wife). In 2010, he starred in The Switch, a romantic comedy, with Jennifer Aniston. In 2011, he played the role of Special Agent Lorenzo Zoil in the comedy Paul, and starred in Horrible Bosses and The Change-Up. In March 2012, Mansome, Bateman's first executive producer credit with Will Arnett, was announced as a Spotlight selection for the Tribeca Film Festival. The documentary, directed by Morgan Spurlock, is a comedic look at male identity as it is defined through men's grooming habits, featuring celebrity and expert commentary. He made a dramatic turn in 2012 with the thriller film Disconnect, and starred in the 2013 comedy film Identity Thief and the 2014 comedies This Is Where I Leave You and Horrible Bosses 2. He also narrated the 2014 documentary Pump. In 2015, Bateman headlined Joel Edgerton's thriller film The Gift, opposite Rebecca Hall and Edgerton. In 2013, Bateman made his feature film directorial debut with Bad Words, in which he also starred. He also directed and starred in an adaptation of The Family Fang. Bateman voiced Nick Wilde, the con artist fox in Zootopia. In 1987, Bateman won the celebrity portion of the Long Beach Grand Prix. Throughout the 1990s, he struggled with an addiction to alcohol and drugs; he stated in a 2009 interview that, "I'd worked so hard that by the time I was 20, I wanted to play hard. And I did that really well... it was like Risky Business for ten years". Bateman features in the video for the Mumford and Sons song "Hopeless Wanderer". Bateman married Amanda Anka, daughter of singer Paul Anka, on July 3, 2001. The couple has two daughters. In late 2005, he had surgery to remove a benign polyp from his throat. Bateman (along with co-stars David Cross and Tony Hale) were criticized for seemingly defending Jeffrey Tambor and his behavior on the set of Arrested Development. During a May 2018 cast interview for The New York Times, Bateman suggested that what actors do for a living is an "amorphous process" and that the entertainment industry can sometimes be a breeding ground for "atypical behavior". Jessica Walter referred to Tambor stating, "In like almost 60 years of working, I’ve never had anybody yell at me like that on a set". Within days after the interview, all three men issued apologies to Walter. Bateman stated that he "overreached" in an attempt to analyze the cause of Tambor's behavior. In an interview with Time, Bateman was quoted saying, "I always thought it's important for people to treat one another with respect at work, no matter what industry you're in. The whole experience has allowed me to do a lot of listening, and I continue that to this day". Bateman received praise for his acceptance speech after winning the Screen Actors Guild Award for Outstanding Performance by a Male Actor in a Drama Series for Ozark. In it he states, "So I just want to say to the people that are at home and not working as frequently as they want, you're just one job away. You're plenty talented. Hang in there". Bateman is an avid fan of the Los Angeles Dodgers baseball team. Bateman endorsed Senator Bernie Sanders in the 2016 presidential election. 1984 Knight Rider Doug Wainwright Episode: "Lost Knight"
1986 Mr. Belvedere Sean Episode: "Rivals"
St. Elsewhere Tim Moynihan Episode: "You Beta Your Life"
The Wonderful World of Disney Steve Tilby Episode: "The Thanksgiving Promise"
Our House Brian Gill Episode: "The Fifth Beatle"
1995 Burke's Law Jason Ripley Episode: "Who Killed the Movie Mogul?" Hart to Hart Stuart Morris Episode: "Secrets of the Hart"
1996 Ned & Stacey Bobby Van Lowe Episode: "Pals"
2000 Rude Awakening Ryan Episode: "Star 80 Proof"
2003 The Twilight Zone Scott Crane Episode: "Burned"
2005 The Simpsons Himself (voice) Episode: "Home Away From Homer"
King of the Hill Dr. Leslie (voice) Episode: "The Petriot Act"
Justice League Unlimited Hermes (voice) Episode: "The Balance"
Saturday Night Live Himself (host) Episode: "Jason Bateman/Kelly Clarkson"
The Fairly OddParents Tommy (voice) Episode: "Oh, Brother!" 2006 Scrubs Mr. Sutton Episode: "My Big Bird"
2013 Yo Gabba Gabba! Bateman Episode: "Super Spies"
2015 The Muppets Himself Episode: "Pig's in a Blackout"
2017 Nobodies Himself Episode: "Mr. First Lady"
^ a b "Jason Bateman: Actor, Film Actor, Television Actor (1969–)". Biography.com (FYI / A&E Networks. Archived from the original on March 24, 2015. Retrieved January 1, 2018. ^ Sirota, Brendan Vaughan,Peggy (March 21, 2013). "Jason Bateman Cover Story - GQ April 2013". GQ. Retrieved 2017-11-02. ^ Freeman, Hadley (October 9, 2014). "Jason Bateman: 'My dirty secret? Playing the straight man. Because he gets to be in every scene'". The Guardian. UK. ISSN 0261-3077. Retrieved 2017-11-02. ^ Smith, Patrick (May 22, 2013). "Jason Bateman interview: 'Arrested Development gave me a new life'". The Daily Telegraph. UK. Retrieved November 3, 2015. ^ Rose, Steve (July 16, 2011). "Jason Bateman: 'I've got a great deal of dirt on Jennifer Aniston'". The Guardian. UK. ^ "Jason Bateman Biography". Yahoo! Movies. ^ Blackwell, Earl (1990). Earl Blackwell's celebrity register. Times Publishing Group. p. 27. ^ a b "Jason Bateman: I'm Not a Great Son". USA Today. May 19, 2008. Retrieved May 28, 2010. ^ "Jason Bateman - Television Academy". ^ Itzkoff, Dave (April 4, 2013). "New 'Arrested Development' Season Coming to Netflix on May 26". The New York Times. Retrieved August 12, 2013. ^ The SNL Archives. October 8, 2009. Retrieved October 8, 2009. ^ "Sit Down, Shut Up". Fox. Archived from the original on April 17, 2009. Retrieved April 14, 2009. ^ "Jason Bateman and Will Arnett Reunite for Web Video". TV Guide. ^ "'Arrested Development' Officially Returning for Season 5 at Netflix". Variety. Retrieved 2018-01-11. ^  Reiher, Andrea (August 4, 2017). "Breaking Bad Fans Have Found Their New Fix in Jason Bateman–Starrer Ozark". Rotten Tomatoes. Retrieved August 7, 2017. ^ "Bateman, Judge Pair for 'Extract'". Entertainment Weekly. 29 April 2008. Retrieved August 19, 2012. ^ Trio of Ladies Going on Couples Retreat" TV Guide. October 15, 2008. Retrieved October 15, 2008. ^ Merry, Stephanie. "'Pump' movie review: Beating the oil drum for alternative fuel solutions". washingtonpost.com. The Washington Post. Retrieved 18 October 2017. ^ "'The Gift'". Dread Central. November 1, 2013. Retrieved November 4, 2013. ^ Wayne, Gary (2012). "The Toyota Grand Prix of Long Beach". Seeing-Stars.com. Retrieved August 19, 2012. 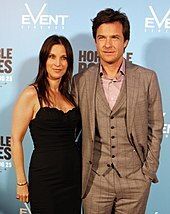 ^ "Jason Bateman: Drugs Almost Cost Me My Marriage". Us Weekly. July 8, 2009. Retrieved August 19, 2012. ^ "Mumford and Sons release hilarious Hopeless Wanderer video". Music Blogged. August 4, 2013. Retrieved August 4, 2013. ^ "Jason Bateman Welcomes Daughter Maple Sylvia". (February 16, 2012). People. ^ "Jason Bateman Undergoes Throat Surgery". (November 1, 2005.) People. Retrieved May 28, 2010. ^ Sopan, Deb (May 22, 2018). "We Sat Down With the 'Arrested Development' Cast. It Got Raw". The New York Times. Retrieved May 24, 2018. ^ Ritman, Alex (May 24, 2018). "Jason Bateman Responds to 'Arrested Development' NYT Interview Backlash: "I Was Wrong Here"". The Hollywood Reporter. Retrieved May 24, 2018. ^ Hammond, Pete (June 13, 2018). "Jason Bateman On 'Arrested Development', 'Ozark', Controversy & Career Expansion – The Actor's Side". Deadline Hollywood. Retrieved June 18, 2018. ^ Gajanan, Mahita (August 23, 2018). "Ozark's Jason Bateman On Being a TV Antihero". Time. Retrieved October 20, 2018. ^ Morin, Alyssa (January 27, 2019). "Jason Bateman Gives Inspiring Speech at 2019 SAG Awards: "You're Just One Job Away"". E! News. Retrieved February 28, 2019. ^ Crist, Allison (January 27, 2019). "Jason Bateman Dedicates SAG Award to Fellow Actors: "You're Just One Job Away"". The Hollywood Reporter. Retrieved February 28, 2019. ^ Kwak, Sarah (September 7, 2009). "Jason Bateman: The Dodgers Fan Stars in "Extract"". Sports Illustrated. Retrieved June 25, 2018. ^ Jensen, Erin (October 25, 2017). "World Series: Dodgers and Astros battle brings out tons of celebrities". USA Today. Retrieved June 25, 2018. ^ Jason Bateman [@batemanjason] (1 Feb 2016). "Go Bernie Go! I just donated. Feels great. Git some" (Tweet). Retrieved February 2, 2016 – via Twitter. ^ Bateman, Justine; Bateman, Jason; Gordon, Sol; Danson, Ted; Gordon, Sol; Paramount Home Video (Firm); Paramount Pictures Corporation (May 31, 1989). "How can I tell if I'm really in love?". Paramount Video. Retrieved May 31, 2018 – via Open WorldCat. ^ "How Can I Tell If I'm Really in Love? - Classroom Version". rottentomatoes.com. Retrieved May 31, 2018. ^ "How Can I Tell If I'm Really in Love? (1986) - Rick Hauser - Cast and Crew - AllMovie". AllMovie. Retrieved May 31, 2018. ^ "Video attempts to answer teen-agers' questions about love and intimacy". February 12, 1987. Retrieved May 31, 2018 – via Christian Science Monitor. ^ "Jason Bateman". advocate.com. December 3, 2007. Retrieved May 31, 2018. ^ "What Do These People Have in Common?". Young Artist Awards. The Young Artist Foundation. 2012. Archived from the original on April 3, 2011. Retrieved August 19, 2012. ^ Flores, Terry (5 February 2017). "'Zootopia' Wins Top Prize at Annie Awards (Winners List)". Variety. Retrieved 5 February 2017. ^ "People's Choice Awards 2017: Full List Of Winners". People's Choice. 19 January 2017. Retrieved 12 March 2017. ^ "Hollywood Walk of Fame - Jason Bateman". walkoffame.com. Hollywood Chamber of Commerce. Retrieved November 14, 2017. ^ Miller, Mike (30 August 2018). "Emmys 2018 poll: Who should win for Best Lead Actor in a Drama Series?". Entertainment Weekly. Meredith Corporation. Retrieved 18 September 2018. ^ Harding, Xavier (17 September 2018). "Emmys 2018: Stephen Daldry of 'The Crown' wins outstanding directing for a drama series". Mic Network Inc. Retrieved 18 September 2018. ^ "The full list of winners of the Golden Globes 2018". Retrieved January 15, 2018. ^ "SAG Awards 2018: See the Complete Winners List". Vanity Fair. Condé Nast. 21 January 2018. Retrieved 18 September 2018. Dye, David. Child and Youth Actors: Filmography of Their Entire Careers, 1914-1985. Jefferson, NC: McFarland & Co., 1988, p. 13. Holmstrom, John. The Moving Picture Boy: An International Encyclopaedia from 1895 to 1995. Norwich, Michael Russell, 1996, p. 373. 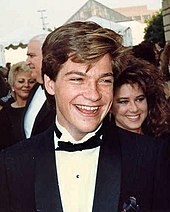 Wikimedia Commons has media related to Jason Bateman. This page was last edited on 20 April 2019, at 04:43 (UTC).